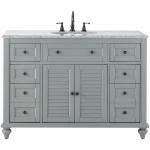 Ideal for your master bathroom, the Home Decorators Collection Hamilton Vanity in Grey with Granite Vanity Top in Grey features cottage styling for a warm and elegant look. 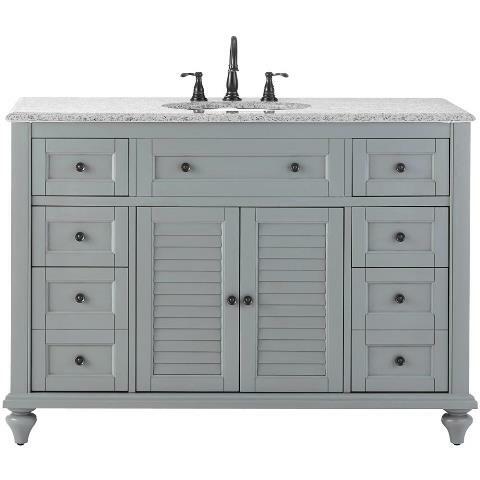 Durable with solid birch and medium density fiberboard construction, this vanity is beautifully detailed with recessed panels, louvered doors, turned feet and a stylish and striking grey finish. The eight full-extension, soft-close drawers and center interior cabinet offer ample storage, while the granite top includes a centerset white basin and is pre-drilled for an 8 in. faucet spread. Pair with matching Hamilton collection pieces, including the wall mirror and linen storage cabinet, to give your decor a polished look.